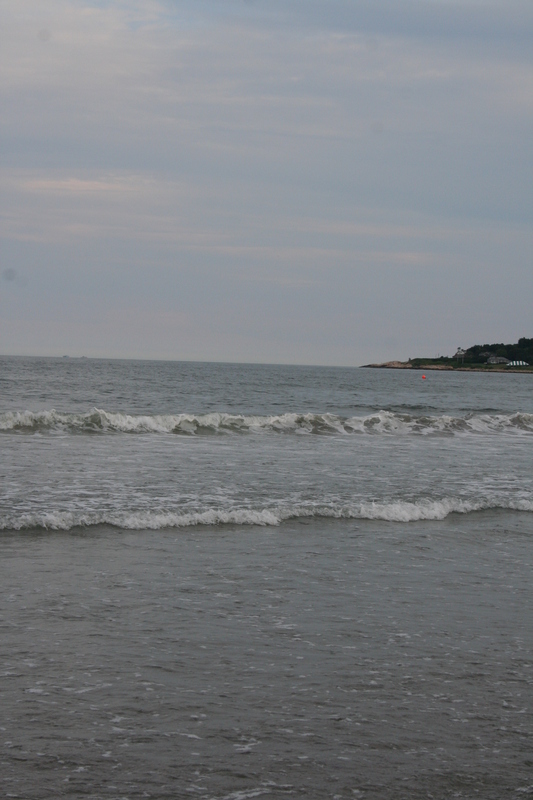 There is nothing like a summer’s night on the beach! Last week we attended the annual summer concert on the beach that I’ve been attending since I was young. I’ve missed one or two, but in the 37 total years it’s been in existence, I have been to almost all of them. It’s a huge affair and it is one of my all-time favorite summer traditions. I love sharing it with my kids. Everyone goes down to the beach first thing in the evening and sets up their space. We bring blankets, chairs, tables. And then comes the food and the wine, and the dessert. Oh…the dessert. This year I was looking for something unique to bring. Something that we hadn’t already done this summer at another night on the beach or parade or cookout. I like to keep things interesting so that no one gets bored. Namely, me. I looked through a cookbook or two, and then I remembered Karen’s Cookbook, and the fact that last time I’d gone through it I’d seen an old favorite of mine: Peanut Butter Swirl Brownies. I knew I’d found my dessert. Melting butter and chocolate chips…what a beautiful sight! As I was cooking them, melting the chocolate over the stove, I could literally see myself making them all those years ago, my college roommate Karen and I living in our house we rented during our college years. This is what I love about recipes: the traditions and memories that go with them. I always say recipes are the ties that bind people together, and I do truly believe that. I thought of Karen and all the fun we had, as I was cooking. 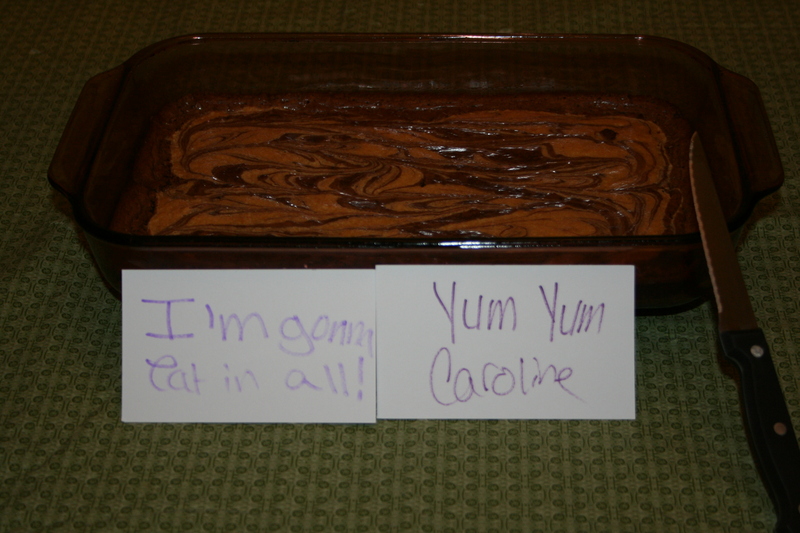 So today, I share with you Karen’s Peanut Butter Swirl Brownie recipe. 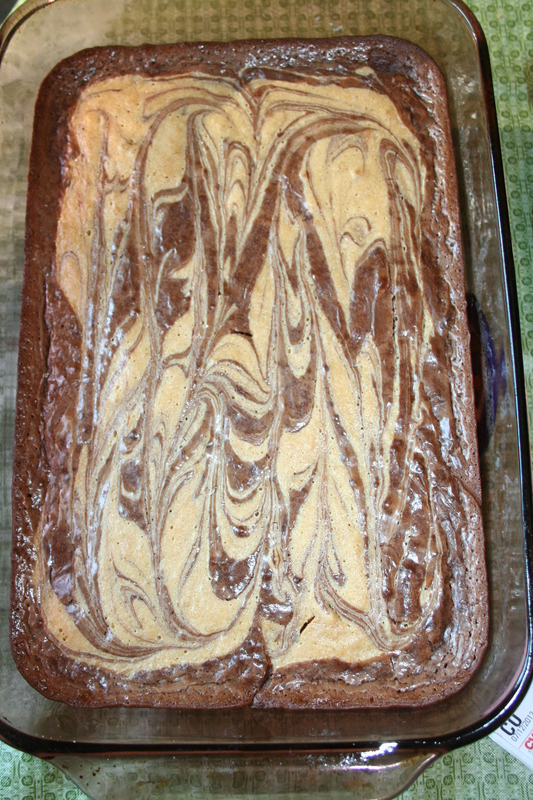 I love that it’s a “from scratch” brownie recipe, and I love the step where you turn the batter into one part peanut butter batter and one part chocolate batter and then swirl them together. You’ll see, it’s so cool. When you make them and eat them, I hope you make some special memories too! Melt chocolate chips and butter until fudge-like. In mixing bowl, beat eggs, sugar, vanilla and sour cream. 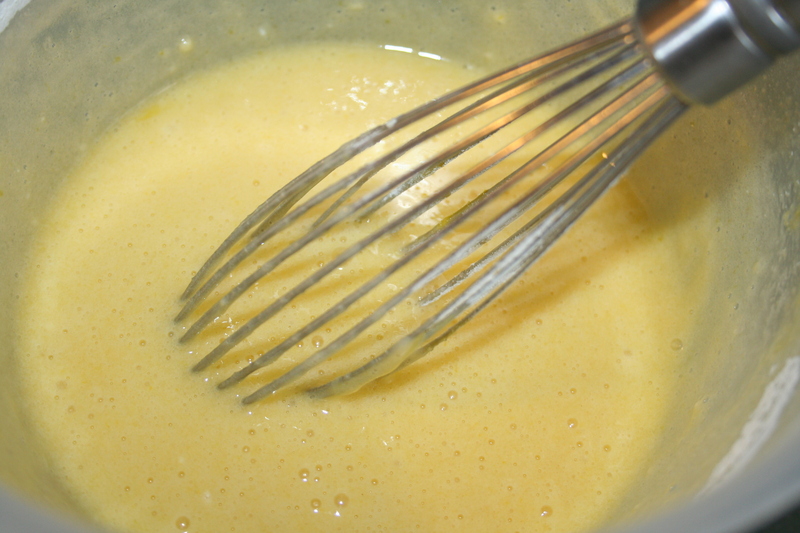 Add flour and baking powder to the egg mixture. Pour 3/4 of the batter into the melted chocolate and stir well. 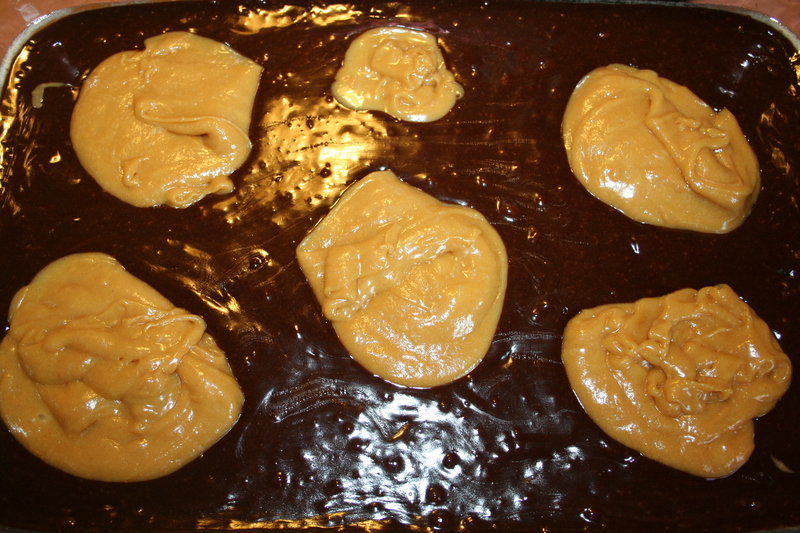 Add peanut butter to remaining batter. Pour chocolate batter into the pan. Spoon peanut butter batter over and swirl with a knife until proportionate. Someone got hold of my camera, apparently.